After months of patient salivating, North Harbour’s new permanent home of locally powered, internationally inspired dining is finally ready to swing open the shipping containers. Complete with shipping container stall fronts, performance spaces, kids’ play areas and the promise of diverse, divine local dining, we’ll be making the 25-minute drive north to Bite Markets every Friday and Saturday night until we’ve tried it all. Perfectly capturing the local spirit that built Bite Markets, renowned chef and caterer Suzie Mills proudly presents Moreton Bay Kitchen: Bite’s heart of home-style cooking. Making the most of locally sourced, fresh produce, we can’t wait to get a taste of their flagship dish, the Bug Bun – Think lobster roll but starring the iconic Moreton Bay bug. The Bug Bun is exclusive to Bite Markets so you better believe that we’re not leaving without one. 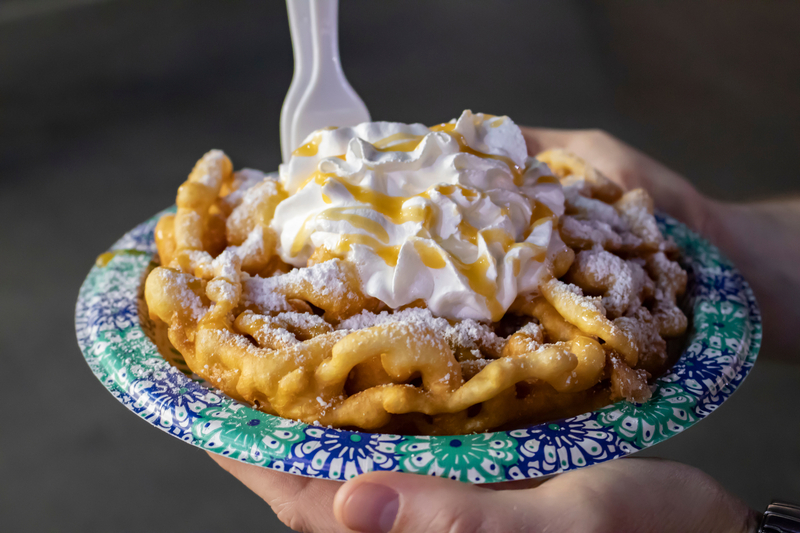 Life is a cabaret ol’ chum and the glorious, gooey symphony of sweetness in every creation from World Famous Funnel Cakes has us bursting into song and dance with every bite – which, fortunately, is exactly how you can score a free funnel cake at Bite Markets. We’re hoping that our killer dance moves earn us a Rocky Road Cabaret – funnel cake topped with vanilla ice cream, hot chocolate fudge and strawberry puree, finished with peanuts and chunks of rocky road. We’re all about finding food that’s equally good on our conscience and tastebuds, so, naturally, we’re dying to check out Chocolate & Coffee Heaven: the brilliant brewers passionate about organic, fair trade coffee blends and original, chemical free chocolate powder made from local ingredients. How can we resist the soul-soothing allure of an organic, Lavender Dream hot chocolate? Well obviously we can’t, so meet us at Bite Markets for a cup. Mount Mee natives Suzanne and Bret Lang have brought the best Bavarian bites from their favourite Berlin borough to create Mitte Berlin Street Food – another Bite Markets exclusive! Of course we’re big fans of classics like freshly baked pretzels and spicy, smoked wurst, but we’re really here to check out their Amsterdam-style “oorlog” fries: double fried fries smothered in peanut sauce, onions and mayonnaise. A good food market doesn’t become a great until they’ve got a powerhouse purveyor of dumplings on their roster, and Bite Markets are proud to feature Tibetan Momo Café for all of your steamed street food needs. These carefully handcrafted creations are stuffed with enough compelling tastes to keep all palates pleased, but for us, it’s all about that Banana Spring Roll – crispy, flaky pastry with a creamy, sweet centre. For five years, Zoe’s Brownies have lit up the food festival and market scene with their brilliant batches of baked-goods featuring the likes of Turkish delight, cookies and cream and red velvet brownies to keep your spirits high and waistband tight. The new way to experience these packed parcels of chocolatey pleasure is with a Brownie Desert Plate at Bite Markets – the famous brownies you know and love topped with ice cream and other delicious sides. Welcome to the ultimate sweetness-induced food coma. North Harbour’s weekly foodie festival is open every Friday and Saturday night until 10pm from March 1st, so grab your friends and stretch-pants, make the trip north and get pumped for the new, exciting tastes on offer at Bite Markets. One of our fave north side cafes is now doing dinner!